face. The result of a camera phone photo. Okay, so it's not wordless, just less wordy than usual. 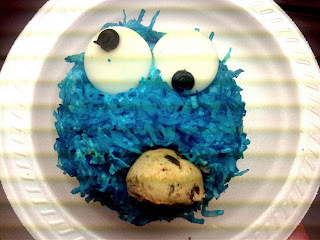 The above cupcake was baked and decorated by a colleague's 11-year-old daughter for a charity bake sale. I see a career in baking in this child's future. That is too cool. What is in the mouth? A cookie, of course! What else would Cookie Monster eat? Thats cool for a 11 yr old! Wow, that's amazing work for a young'un! Is that coloured dessicated coconut as his face? yes, it is. I wasn't sure until Jacob ate it this evening. Nice to see Cookie Monster is still a favorite after all these years!